I suppose mornings were crazy before we had a kid, especially Tuesdays. We both have important meetings on Tuesdays. But now? Mornings are complete chaos. So its strange that we may have made a major life decision this morning over coffee (hot water with lemon for caffeine free me). Spork awoke a full hour earlier than usual today which means the whole house was up and going at the crack of dawn. As a result, Bill and I found ourselves in the kitchen with time to spare long before either of us had to leave for work. Funny how life works. A few unplanned minutes with my husband may have changed our destiny. We decided to use the gift of time to settle on a Plan C (or D, E, or T depending on when you start counting). This cycle is going to work, but if by some chance my attempt to shape reality through positive imaging fails we have our next step planned. This is not our morning epiphany, we have known this for some time and have already shared Plan B in the blog. Our quest will continue with one more full IVF cycle at our miracle clinic. But what would happen if that is a bust? If my eggs fail us in another full cycle? Our plan didn’t stretch that far into the future, or at least that was true until today. It was good advice, so good in fact that I haven’t been back since that first visit. Truthfully, the question pissed me right off. That’s the real reason why I didn’t make a second appointment for the following week as she suggested. I buy baby clothes, maternity clothes, and have a crib set up in my bedroom because I believe it is important to focus on what you want. I have always visioned my goals and achieved them. I don’t know why baby making should be any different. This therapist was asking me to send counterproductive thoughts into the universe that may destroy the good vibes I’ve sent. Bah. Her question also made me cry. Making me cry in front of strangers, even if they are therapists, also pisses me right off. So I didn’t go back (it helped that the hormones started wearing off soon after the visit). But I did start thinking about acceptance like she recommended. The therapist struck a chord because she felt that if I opened myself to the possibility of it not working and embraced what we have, it may just prepare me mentally and emotionally to welcome another baby into my being. That caught my attention. So you mean accepting that I might not get pregnant may help me get pregnant? Sheesh. I told you this fertility stuff is crazy. So I pondered “what is the worst that can happen”. Turns out its not so bad. The worst that can happen is I have a great job, a loving husband, and of course Spork. I can live with that. Its enough for me. It took over a month of thinking and blogging to arrive at the conclusion that what I have now is all I need. I don’t need to move to donor eggs and I don’t need to adopt. I have been very clear on this for the last couple of weeks and it has lifted a huge emotional weight. Which brings me back to my quiet morning with Bill. It was the first time I have been able to share this acceptance with him. And a funny thing happened. Bill looked panicked. I have been driving this bus with him along for the ride for a long time. Today it was as if I pulled the bus over to a screeching stop and screamed “Get out!” without any warning and for no observable reason. For the first time ever we seriously discussed donor eggs. When I told him that I was afraid that I might not love a baby that wasn’t created from my eggs as much as Spork he said “but you will carry it for 9 months, you will make the connection, it will be your baby.” He was fighting for what he wanted. He looked fearful but was kind and understanding. He was quietly, lovingly and sweetly pleading. It was a short conversation but I knew instantly what we would do. Plan C.
If necessary, someday I will carry a life that a lab will create with the reproductive ingredients of Bill and another woman, but it will be ours. This is not something I was even considering a possibility until now. I confess my fear of donor eggs is totally egotistic. 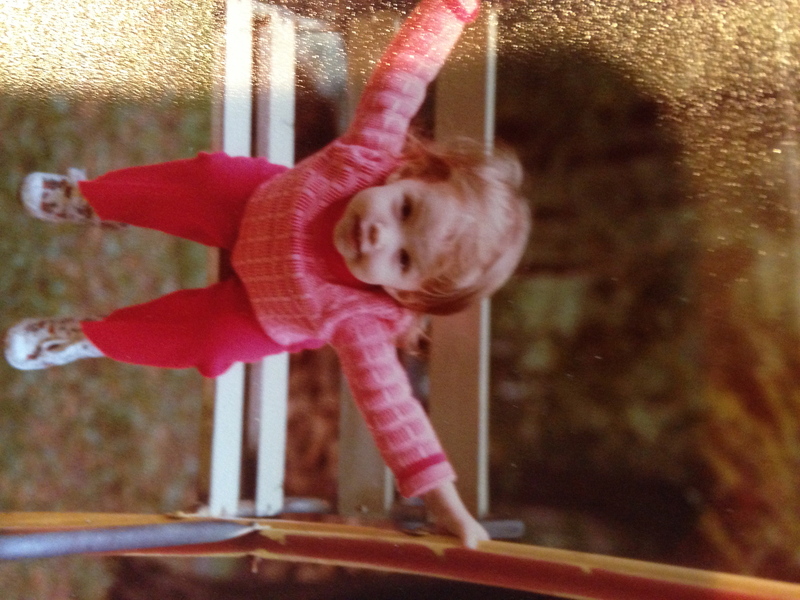 I love that when I show pictures of myself as a child that my daughter swears “Its Spork! It’s Spork.” I wasn’t ready to give that up until today. However if I can accept not having another baby at all, I can embrace having another baby for and with the love of my life. With my newfound acceptance I already have a deeply seeded knowledge that I can and will love the child as fully as I love my own genetic child. It is as if a switch was flipped in my brain during our daybreak discussion that flooded a whole new realm of possibilities with light. There is still much more to discuss, but we will tackle that when the time comes and probably not on a Tuesday morning. Of course all of this is likely to be irrelevant. If this cycle doesn’t work I am sure the next one will. Or at least that is what I am focusing on for now. ← Did You Really Just Say That? We have stared down this what if in a different way. Not if I don’t get pregnant (though that worries me too!) but what if another baby dies. We came to the same conclusion. If genetics is the problem, take genetics out if free equation. Here’s to hoping that neither of us need that plan C.